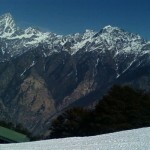 It was February end when we decided to take a trip to Auli. We started our trip from Dehradun. The route to Auli from dehradun is dehradun – rishikesh – devprayag – srinagar – rudraprayag – karanprayag – chamoli – joshimath. We went to Joshimath by car. Joshimath is about 300km from dehradun and it took us 12 hours to reach joshimath. Auli is another 16km from joshimath at height of 2895m. We had already booked rooms in tourist rest house in Joshimath, so we directly moved there for overnight stay. Next day, we started our trip, full of excitement, looking forward to having fun in Auli. When we reached Auli, we went to ropeway office and booked tickets. Ticket fare for Ropeway was Rs 500 for both sides. It took us about 20 minutes to reach Auli by ropeway. As it was February end, we could see snow as we went higher up on the ropeway. Auli is the kind of place where you can find pleasure, adventure, and nature’s beauty at its best. The deodar and oak forests cover the slopes and reduce the velocity of the chilly winds to the minimum. The place is famous for skiing and for its scenic beauty and we were not disappointed! We could see people skiing on the snow. It was difficult to resist ourselves, so we decided to ski. Skiing at Auli was a great experience, full of adventure and fun. 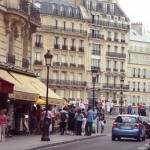 I thought that it would be very cold there, but surprising it was very hot. Perhaps because it was a bright sunny day or perhaps because of the multiple layers of clothing that I was wearing. If you are new to skiing, there are ski instructors available who provide skiing lessons to newbies. 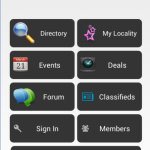 Ski instructors are local people and you can bargain with them for ski lesson prices . 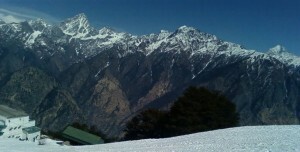 I had a wonderful time skiing at Auli, did not realize when time passed away. The heart was not allowing us to leave the Auli and its natural beauty but we were completely exhausted and it was time to leave. So with heavy hearts, aching bodies and good memories, we took the ropeway and came back to Joshimath. This travel review was posted by Ms. M. Rawat. She resides in Dehradun, India.